Kinetics II: What determines reaction rates? Thermodynamics tells us whether something is spontaneous and how much energy will be used/generated in a reaction. Kinetics tells us how fast a reaction will occur. These two disciplines cover the same phenomena, but from totally different angles. As a result, you can’t use the information from one to infer the other. What I didn’t address, however, was the question of why some chemical reactions are fast and why some chemical reactions are slow. To understand that, we need to draw some pictures. Step 1: Put the reagents in the same place so they can react. Step 2: Give the reagents enough energy so they can react with each other. Step 3: The reagents wiggle around until they join together in just the right way to form products. Step 4: When the products are formed, energy will have either been consumed for an endothermic reaction or given off for an exothermic reaction. Clearly, if the reagents aren’t next to each other, they won’t react with each other. In some cases, there may only be one reagent present (as would be the case in a decomposition reaction), but usually you have to put them together in whatever location you want them to react. Let’s say that it’s Thanksgiving and your Aunt Mabel has come over to the house. When she walks in the door, she and you are both in the entry room of your home. Unfortunately, she likes to give you a big fat old person kiss on the lips whenever she sees you. 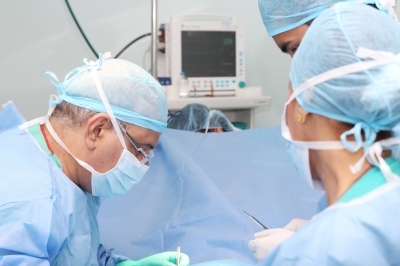 You’re in the same place, so the awful process can get started. At least she has her teeth in. Normally, you’d never kiss Aunt Mabel on the lips in a million years (at least, I hope you wouldn’t). However, if your father gave you ten bucks to be nice to your Aunt Mabel, you’d probably go through with it to get the money. It wasn’t enough to put you and Aunt Mabel in the same room – there needs to be some additional force to get things to happen. At the risk of being horribly disgusting, I’m going to stay with the Aunt Mabel analogy here. 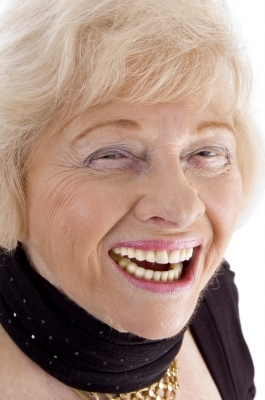 You see, your Aunt Mabel wears a huge jacket full of her housecats and smells like garbage boiled in bleach. Though you’ll give her a kiss for the $10, you’ll have to maneuver in such a way that you minimize your contact with the insane old woman and her entourage. It’s not like you can just go up and get it over with – you actually have to wedge yourself between the feral animals to make it happen. Step 4: When the products are formed, energy is either released or consumed. In this case, you consume $10 when it’s over for having given her the kiss. Which is good, because you’ll need it for therapy when you’re older. “Therapy” meaning “lobotomy” in this case. The axes on this diagram show energy and time. Time is the x-axis, which indicates that as you go from left to right, we’re watching how the process evolves. Energy is the y-axis, so we can tell how much energy the reagents and products have at any particular moment during the reaction. “Reagents” represents the two reagents before they start reacting. They are in the same beaker, but as yet have not reacted with each other. “Products” represents whatever is made in the reaction. These products will have completely reacted and are in their final state. Ea is the “activation energy” of the reaction. The fact that it initially goes up represents the need of the reagents to have some energy added before they will undergo a chemical change. This is why gasoline doesn’t spontaneously explode in your gas tank – the reagents of gasoline and oxygen are present, but there’s not enough energy to make it take place. In order for the reaction to occur, the amount of energy represented by the activation energy first needs to be added. Ts is the “transition state” of the reaction. During any chemical change, there is some point at which the reaction has taken place halfway. The structure of the transition state will be halfway between that of the reagents and products, and will be unbelievably unstable because it doesn’t want to stay half-reacted. For example, if A and B form AB, you might think of the transition state as being a situation where the bond between A and B is half-formed. The transition state is sometimes called an activated complex, so if you see somebody write that, don’t be too surprised. ΔH is the heat of reaction (also called the enthalpy of reaction). In this case, we can see that the products are lower in energy than the reagents, indicating that energy has been lost and that this is an exothermic reaction. What does this have to do with reaction rate, anyway? In this reaction, you can see that in order for the reaction to go anywhere, you need to add some quantity of activation energy, represented by the Ea term above. Once you have this much energy, the reaction will proceed by itself. 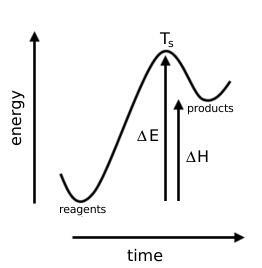 The rate of a chemical reaction fundamentally depends on the activation energy of the reaction. If the activation energy of a reaction is very high, a lot of energy will be needed for the reaction to get started. This means that at any particular temperature, reactions with high activation energies will be slower than those with low activation energies. Reaction rates will increase as the temperature of a reaction mixture is raised. After all, if you increase the temperature of a mixture, you’re increasing the amount of energy that’s available to the reagents. This added energy makes it easier for the reagents to overcome the activation energy and form products. Rate doesn’t depend on whether something is exothermic or endothermic – it depends only on the activation energy of the reaction. We can’t see transition states. 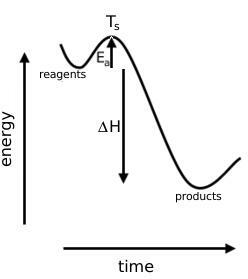 If you think of an energy diagram as describing the “altitude” of the process in energy terms, the transition state is in a very unstable location and tends to move quickly either to form products or revert to reagents. What does an endothermic reaction look like? Like this. As you can see, the same features are present in this diagram as the one before, except that the heat of reaction is now positive rather than negative. From the information gathered here, you might expect that this reaction will be slower than the one in the other diagram because the activation energy is higher – this is a correct assumption. However, don’t let it convince you that all exothermic reactions will be faster than all endothermic reactions – it’s impossible to know whether it’s true unless you know the specific energy diagram for this reaction. Let’s move on to the next tutorial to learn more. When I talked about the transition state of a reaction representing the halfway point of the reaction, I am ignoring the Hammond–Leffler Postulate, which states that transition states can be “early” or “late” depending on the reagents and products. This is something that’s not discussed in introductory chemistry, however, so don’t worry about it. When I say that “the rate of a chemical reaction fundamentally depends on the activation energy of the reaction”, I mean that this is true assuming that all other aspects of the reaction are equal. Clearly, reaction rate depends on factors like concentration and temperature, but if we leave these constant for two reactions, the activation energy will be the feature that characterizes the reaction rates. I’ll discuss this in much greater detail later.